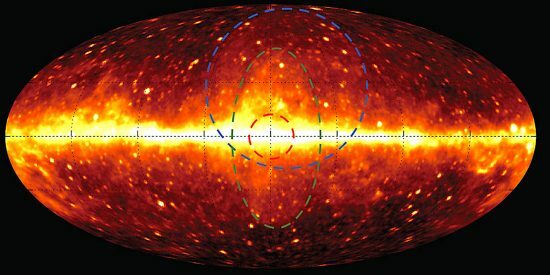 The gamma-ray sky constructed from 6.5 years of 1–6.5 GeV data from the Fermi-LAT telescope. Colors indicate the strength of the gamma-ray emission, from low (black) to high (yellow). Credit: Fermi-LAT. Gamma-rays from electric particle accelerators in space. Gamma-rays are the highest energy wavelength in the electromagnetic spectrum, according to physicists. They are “electromagnetic particles” called photons. Since matter is thought to exist as both waves and particles, and photons are a class of particle called “bosons”, they are said to “carry” electromagnetic force. Modern physics believes all forces are facets of material phenomena, so electromagnetism requires the photon in that view. Gamma-rays travel at enormous velocity (up to 2.993 x 10^10 centimeters per second, or 10,774,800,004 kilometers per hour), so “relativistic effects” are observed. When a relativistic electron strikes a low-energy photon, the collision slightly slows the electron and ramps-up the photon to gamma-ray energy. Gamma-rays are, therefore, “ionizing radiation”, because they can knock electrons out of an atom. As mentioned, gamma rays are the most energetic, with values 10^15 times greater than visible lightwaves. They also have short wavelengths, less than 0.1 nanometers, in some instances. Since most galaxies, including the Milky Way, are thought to harbor supermassive black holes in their cores, astronomers believe that matter might be “torn apart” by intense gravity, creating exotic particles, while emitting gamma-rays. NASA launched the Fermi Space Telescope on June 11, 2008. Its primary mission is observing high frequency electromagnetic waves in space, including gamma-rays. Fermi detected intense gamma-ray emissions from the Milky Way. Twin lobes extend approximately 65,000 light-years out from each side of the Milky Way’s central bulge. However, rather than “bubbles” of radiation, the lobes are the signature of Birkeland currents squeezing plasma and charged dust into z-pinch zones. The intense electromagnetic fields associated with Birkeland currents cause electrons to accelerate with velocities close to light speed. When charged particles, like electrons, accelerate through an electric field, they emit synchrotron radiation that often takes the form of X-rays and gamma-rays. Electric charge surges out along galactic spin axes, forming double layers that are seen as “lobes.” Electric charge spreads out around the galactic circumference, flowing back to the core along the spiral arms. Since the elements in a galactic circuit radiate energy, that energetic radiance shows that they are powered by larger circuits. The extent of the larger circuits may be traced by the polarized emissions coming from them. Electric Universe advocates know that radio lobes far above the poles of active galaxies are the signature of Birkeland currents—partial field-aligned ring currents extend out from galactic cores. That moving charges generate an electromagnetic field has been known since the days of Michael Faraday. As previously stated, moving charged particles constitute an electric current, and that current is wrapped in a magnetic field. When more charged particles accelerate in the same direction, the field gets stronger. Jets from opposite poles of a galaxy end in energetic clouds emitting X-ray frequencies, or gamma-rays. Those phenomena are based in plasma science and electric circuits, not gas kinetics, gravity, or particle physics. Astrophysicists see magnetic fields but not the underlying electric circuits, so they are at a loss. Plasma’s behavior is governed by those circuits. Double layers with large voltages between them often exist. The electric forces in double layers are incomparably stronger than gravity, broadcasting electromagnetic waves over a wide range of frequencies.